​There is something magical about Yellowstone National Park. Take your students on a virtual field trip with this fascinating Minute. This Minute gives the reader some sense of the persuasion needed over a long period to get Yellowstone identified and then maintained and protected as a national park. See if your students can pull out the problems and the arguments for supporting Yellowstone as a designated national park, and later as a park that required staff to protect it. What might have been the arguments against these ideas? Take a look at the photograph that saved the bison of Yellowstone (from the “notorious poaching incident in 1894” mentioned in the Minute) and discuss why a visual is sometimes more persuasive than text. Use this Minute to discuss the reasons that environmental protection and the preservation of endangered species might be controversial. Where does the tension come from? What values are being balanced and weighed? Do these issues present problems in other countries? Why or why not? In the included graphic and in the Minute, Author Whiting mentions the Trans Pacific railroad and how that changed the travel possibilities for US citizens. Use this opportunity to explore the history of the location and the building of this railroad system, and then look at the long-lasting impact this achievement had on our history. What exactly makes a geyser erupt? What is the science behind them? Take a listen (under 12 minutes) to this episode of NPR’s Here and Now to find out the science behind this fascinating phenomenon. Can your students think of any way to harness this kind of energy? What are the geologic features that make Yellowstone so unique? Check out the information provided by the National Park Service and learn the science behind tectonic plates, volcanoes and more. Use this Minute to take a closer look at these two artists. Explore the impact of the art and photographs they created. Discuss possible artistic occupations. Check out the Smithsonian’s collection of Moran’s landscapes and pencil drawings of Yellowstone, and the Getty Museum’s collection of Jackson’s photographs. 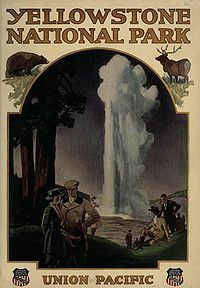 In this Minute, Author Whiting says Yellowstone is “possibly” the first national park in the world. He uses the word “possibly” because there is some confusion about the facts. Have students do some digging and compare the information they find at different sites. Have them keep a log of the sites they are visiting and what each site says. When they have had a chance to examine the data (twenty to thirty minutes should be adequate), have them reconvene to discuss their findings and see if they can reach consensus. To finish, ask them to write about what to look for when they are evaluating information from multiple websites.